“Désalpe” is the best-known of all traditional mountain festivities. After more than four months of grazing in alpine pastures, cows make their way down to the plain. Charmey’s crowning event of the year, has acquired international renown. Those who love traditions and authenticity find that this celebration, every fourth Saturday in September, is a must. 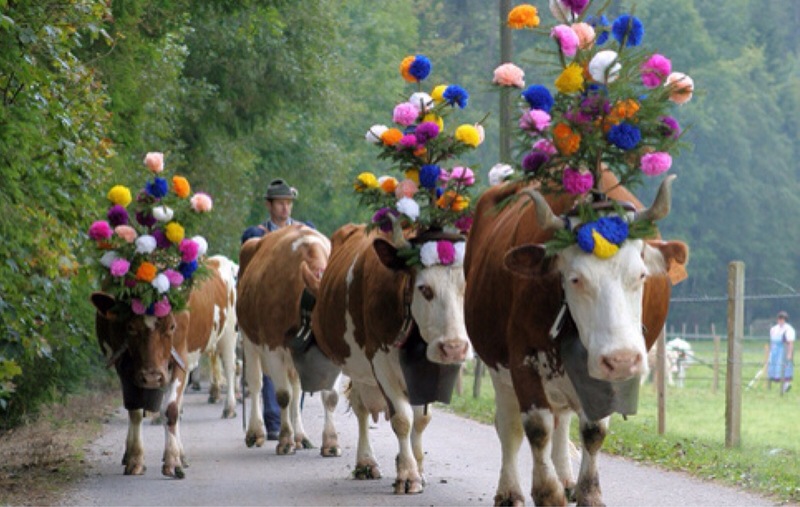 In a joyful clanging of bells, in the profusion of colours of their flowered headdresses, the herd returns to the plain. This “Rindyà” (descent from the mountain pastures in patois) is the reflection of mountain traditions and guarantees their continuance. The sale of cheeses made in the mountains, much appreciated by connoisseurs, runs parallel with the stands of almost 90 craftsmen and women. As for the musical side of the day, the Alpine horn, flag throwers, country orchestras and brass bands give the Désalpe the lustre it deserves. Piękne, barwne i warte utrzymywania w tradycji.